Stunning weather and great snow conditions. Cold and light. Could have been a bit deeper but whatever. Plenty of soft turns to be had. Friday nights blow out followed by Sat hearty breakfast and heading off up the hill. Cresting the ridge I was stunned by what a beautiful day it was. Crystal clear and cold. Dropping into the little face to get to our destination was a surprise. Deep, wind blown snow. A little whoop escaped my lips. Soft bumps and an easy traverse. Skins on. Bish, bash, bosh. At the top. Choose to drop into the north side as snow seemed to be best there and it was pretty nice indeed. Quite blown and a little variable but great skiing! 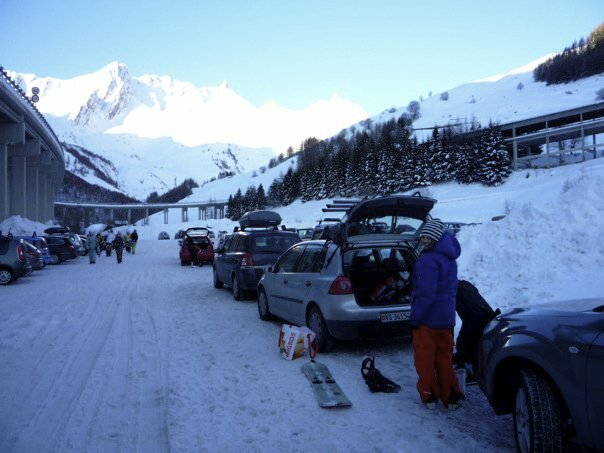 Ski out, muck around and some Olympic inspired DH piste run. I discovered that there are tools for jobs. Ski touring boots and soft skis do not fair so well in the discipline of amateur DH skiing! Home for a read, tea and toast and then heading out for evening skin. Was a bit later than expected due to the book reading. Darkness came and up I went. Happy to be in my little world of skin, skin sugar. Head torch was not needed due to the moon peaking out and the piste bullies lighting up my world. Quite surreal. Cresting the top it was a bizarre scene with the big, powerful light on Mt Gele. A quick couple of snaps, change around and a very cold ski down due to forgetting proper gloves. Sunday. Hearty bannana pancakes and maple syrup to start. Tasty. Off into the lovely day and upto Col des Gentianes with the masses. A skin across to Catwalk with a very difficult traversed skin. The top 3 inches constantly falling away made it tricky and worrying at times. We summited to Ferret and were met with 5 tracks. Nice! A very wind blown/slabby top led into better and better conditions. Love this run. Skin out and then round to Clueson Dam. We took some more Olympic inspiration and did our best ‘We are good at Moguls’ impressions. No one was fooled. Up and over the ridge and finished on Rock and Roll. Love this couloir. Skied out but soft bumps and still fresh on the sides. Managed the Old Frog jump here and there which makes me smile. Home. Finish book, old pancakes and coffee then a quick skin into the departing evening. Lovely. Close to a perfect weekend I’d say…my legs feel it today. Out every day that I was in the mountains come grey, cloud, snow or wind and we had a lot of that. Its definately a real winter with lots of cold but interspersed with brief warm periods. There is now plenty of snow and the fear of breaking knees/ankles on rocks has dissapeared. Christmas bought more snow but a warming period. It was quite interesting to ski the very slow snow. I really enjoyed all the turns we got and its all good. Trying to take on the mantra of ‘no such thing as bad snow just bad skiers’. 27th Dec, Kate and mine’s 2 year aniversary, we decided to head over into Italy for some touring in the stunningly beautiful Mont Fouchon area (I think). I had been there once before and was blown away by the beauty of the place. Ian and Emily tagged along with Emily’s first split experience and Ian not in tip top form from one too many rum’s the night before. I was loving the area and cruising along. Fanatstic tree terrain to lap on a stormy day but I noticed a crust on top. Quite a big one too! Not sure if it was rain crust, warming or wind. We continued on breaking out of the trees to see the amazing alpine bowls with a great view of the back of the Grand Combin and views to the Aoste valley. To the left were some GREAT tracks down a good sized couloir, not sure how the got into it though so will need some investigation. We hit a plateau and could see our destination. A col with a name I don’t know. Maybe I should get some maps!! the Col looked pretty close but that was an eye lie. the wind was really raging by this point and I noticed some cloud building up. After a good solid 30 mins I reached the top, went to the col, looked at mountains and hunkered down from the raging wind. I thought I might be a while up here so decided to dig a snow hole in the wind lip. Was good fun, kept me sheltered and warm from the effort. Kate arrived and then Emily and Ian on the split boards. Not loving it by this point and Emily paniced when she saw the snowhole!! A quick bite of sandwich, skins off and ready to go down. I must start bringing stove so I can make a hot drink. That would be GREAT! The descent was, well, sub optimal with a pretty harsh crust and flat light but was still fun. After 1000m vert ascension peoples legs were tired and bellies ready for Italian lunch! We rocked upto Etroubles and were just in time for late lunch. Some free champers from the proprieter, some parma ham to die for, pasta, Gelato and a red wine which was so good. In car, through tunnel and back o Verbier to hit Apres Ski at the Farinet! A foot of fresh snow fell last night. Lovely. Got the big skis out (Faction Royales) and met with Ian at Savoleyres lift. Was suspect of higher terrain and just wanted to blast around without to much worry. Lift took ages to get open but we were first 10 up. Couldn’t resist a run beneath the lift all the way back down in the sun. Too flat really but a good leg warmer. Loads of visible slides, some by patrollers and some natural. Really wind loaded on steeper north sides and at low level too. Can’t imagine what some of the higher bowls might be like. Ian and I lapped the Nord lift and hit some steeper bits. First real chance this season to start letting it go as the snow depth is getting good. A small hike gave us some short but great steep turns. Those turns flanked by avalanche debris! 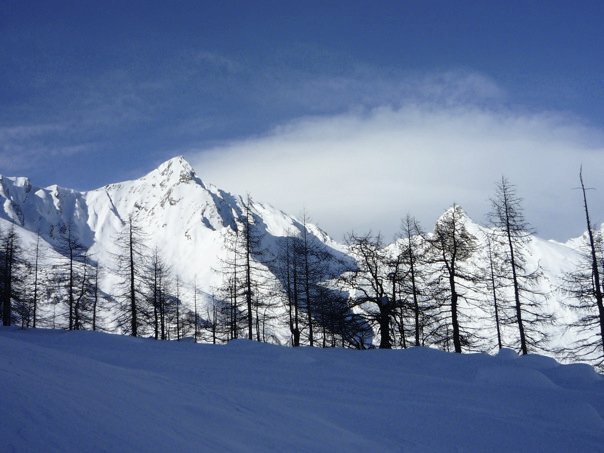 Cloud came in and we hoiked over the shoulder to Croix De Coeur and enjoyed deep turns all the way to the bus. Temperature had gone positive and with reports of more snow/rain we shall see what happens but in the short term care is needed me thinks. The Christmas holidays arrive and with it Winter. Proper freaking cold. Saturday dropped some good snow so we decided to head to Bruson and skin up and along to Tete De Payenne. Cold. Very Cold indeed and very windy on top. Everything frozen. Not too much hanging about but good ski straight down the North face. Funny ski touring skiing. Had a “easy” day on Sunday. Skied Tortin Central Couloir and the wind has done some strange things. Very hard skiing. Quick much around in Siviez/Plan De Fou. Still not enough snow and a lot of rocks. Cheese Fondue and Wine to follow. Monday dawns grey so a gentle Zone 2 skin from the house up to Tete D Etablons. Very difficult to stay in Zone 2 but took a pretty traversing route through Bacombe. Had to break trail the last hour and was draining. Finally got to the ridge and checked out the infamous Frenette Couloir. Look good but suspected windloading. Cut the cornice with skiis and dropped in. Lots of cracking but stayed stable. Jumped up onto a steeper ramp and cut it purposefully. Its slipped down about 20cm. Stopped and let it run out and skied the rest down. A tip I picked up from Greg Hill. The foehn returned with 20ish cm of snow. Very strong winds indeed which is causing some pretty big problems up high. A SW direction means all the north facing slopes are loaded with snow on a hard surface. Will have to be careful in the coming weeks. More snow (20-30cm) forecast tonight and a big warm up on 24th then freezing again post Christmas day. Photos to come when I get them off the camera!